Rising damp is the upward movement of moisture through walls and sometimes floors by capillary action from below the ground. It can rise to a usual maximum height of 900mm in the walls depending on the masonry types and outside ground levels. Salt deposits generally form a horizontal tide mark, below which there will be discolouration, peeling wallpaper and possibly white efflorescent salts which have been drawn out of the brickwork by the water. All buildings are surrounded by natural moisture that is trying to get into the dry structure of the building and it is for this reason that it is imperative to get an expert in to correctly identify the source of rising damp in your home. 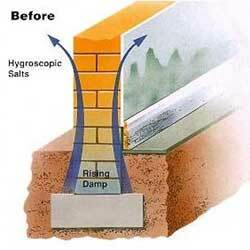 Atlantis Damp Proofing & Timber Specialists Ltd perform low-maintenance damp works to guard your Cheshire based home. When a building is constructed, a rising damp treatment is generally installed in the form of a damp proof course in the walls to prevent rising damp appearing, however, when this treatment does not exist due to the age of the property or becomes damaged the most common result is rising damp. As a home owner, the most likely signs that you may have rising damp in your home is through signs of damage to interior plaster and wall coverings. Floors can display moist patches and staining, materials such as stone and brick are naturally porous and will soak up moisture like a sponge without the aid of a damp proof membrane or rising damp treatment. We have recently seen some beautifully renovated properties where the original stone or quarry tiled floors have been left in situ and the damp has been rising up through the substrate, causing high damp readings and visible damp patches. If you suspect damp to be present in your property, don’t ignore it! Left untreated the damp will continue to rise and, arguably more importantly, any floor joists and other interior timber in contact with the damp wall or floor are highly likely to rot, potentially bringing the structural integrity of the building into question. A new DPC (damp proof course) will need to be installed. This is achieved by removing all internal plaster and backing coats back to the brickwork at a minimum of 1m or 300m past the last damp readings. The most practical and effective way to create a new damp‐proof course in a wall is to make an existing mortar course into a waterproof barrier using high strength damp-proofing creams. We drill holes into the mortar bed at 120mm intervals and injecting Dryzone® Damp Proofing Cream into the mortar beds. This is a high strength silicon based Thixtropic cream, which diffuses naturally into the substrates. After injection, Dryzone® reacts to form a water-repellent silicon resin network within the capillaries of the substrate. This network is permeable to water vapor which means that the walls can breathe and dry out naturally. This formulation is not reliant on alkalinity for effective curing and can be used to treat brick, stone and other substrates and therefore preventing dampness from rising up the wall. For more about why Atlantis Damp Proofing & Timber Specialists Ltd deem Dryzone® Damp Proofing Cream to be the best, check out the independent accreditation’s it has received: http://www.safeguardeurope.com/applications/rising-damp-and-its-control/research-and-development. Eliminates the need to introduce large volumes of liquid carrier into the wall. Dryzone is over four times stronger than many competing products. 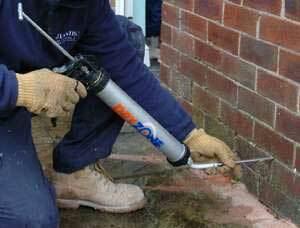 No problems with damp-proofing fluid leaking into neighboring rooms or properties. Can be used in situations where power is not available. Once the affected area has been injected a 3-1 sand and cement waterproof render is applied to prepared brickwork followed by multi finish plaster once the render coat has been allowed to dry out. 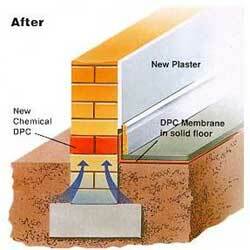 Electro Osmosis is a system where by a series of holes are drilled into the brickwork above ground level. Titanium anodes are then inserted into the drilled holes, which are linked by a special connecting wire that is pointed into the wall externally. Internally, it can be inserted behind skirting boards, so that the plaster remains undisturbed, as long as the there is no evidence of hygroscopic salts. A very small but perfectly safe electrical current is passed through the anodes and connecting wire. The effect of the charge is to repel the rising moisture molecules down the walls and harmlessly back into the ground. Providing this tiny positive charge is maintained, the protected walls will stay dry and damp free. Suitable for Listed buildings and period properties as evidence of there being a damp proof course will not be seen! Our surveyors will investigate fully the causes of damp within your property and explore the suitable method of treatment. All of the results and feedback will be provided in a full written report, along with recommendations and details of the cost.